Samsung Galaxy S8 Plus vs iPhone 7 Plus: which is better? Samsung’s new phablet flagship has arrived and it's a monster, with a 6.2-inch screen. As such, the Samsung Galaxy S8 Plus dwarfs the 5.5-inch iPhone 7 Plus, at least in terms of screen size - though surprisingly the overall body isn't much bigger. But a lot of other things also differ between these two plus-sized handsets, from their operating systems to their chipsets and beyond. Here's how they stack up. The Samsung Galaxy S8 Plus has a metal frame with a glass front and back, a lot like the Samsung Galaxy S7 Edge, albeit with smaller bezels above and below the edge-to-edge screen. The iPhone 7 Plus on the other hand leans more heavily on metal, with a metal unibody and larger bezels above and below the screen, necessary in part to house the home button. Those larger bezels mean the iPhone 7 Plus is a similar size to the Samsung Galaxy S8 Plus overall: the 7 Plus comes in at 158.2 x 77.9 x 7.3mm, while the Galaxy S8 Plus is 159 x 74 x 8mm. That makes the S8 Plus slightly thicker and longer, but not as wide, despite it having a much larger screen (discussed below). Both phones are clearly premium devices though. The glass back of the S8 Plus may make it more fragile, but then again, it’s IP68 certified – meaning it’s dust proof and water resistant to 1.5 meters for up to 30 minutes – while the iPhone 7 Plus is IP67 certified, meaning it’s ‘only’ water resistant to a depth of 1 meter. The Samsung Galaxy S8 Plus has a 6.2-inch screen, which makes it bigger than most phablets and far taller than the 5.5-inch iPhone 7 Plus – though, again, the overall handset size is actually not much larger. That’s not the only thing working in its favor either, as the S8 Plus also supports HDR video for more impressive contrast, which the iPhone 7 Plus doesn’t. Other differences include the fact that the Galaxy S8 Plus has a curved display, where the iPhone 7 Plus is flat, and that Samsung's model uses Super AMOLED, for more vivid visuals than the LCD display on the iPhone 7 Plus. The Samsung Galaxy S8 Plus also employs an 18.5:9 super widescreen aspect ratio, while the iPhone 7 Plus is a more normal 16:9. Overall the S8 Plus looks to have a more immediately impressive - if not necessarily better - screen, though its monstrous size may actually be off-putting to some even though the overall chassis isn't much bigger. As flagship phones the Galaxy S8 Plus and iPhone 7 Plus are both very powerful. The iPhone 7 Plus uses an Apple A10 Fusion chipset and 3GB of RAM for almost perfectly smooth performance. The Samsung Galaxy S8 Plus on the other hand uses an octa-core chipset clocked at up to 2.35GHz. Samsung hasn't confirmed the name of the chip, but we're expecting the Exynos 8895 chipset in most of the world and a Snapdragon 835 one in the US. Both of those are top of the range and brand new... so new, in fact, that they’re not used in any currently available phone. And with 4GB of RAM too the Samsung Galaxy S8 Plus should easily be a match for the power of the iPhone 7 Plus. What will be more noticeable is the differences in their operating systems, as while the Samsung Galaxy S8 Plus runs Android Nougat, the iPhone 7 Plus uses iOS 10. Although their interfaces have become more and more similar over the years there are some key differences, with iOS forcing you to keep all of your apps on your home screen while Android gives you an app drawer for example. Android is also more customizable, but Samsung’s TouchWiz-infused take on it isn’t quite as aesthetically appealing as iOS. 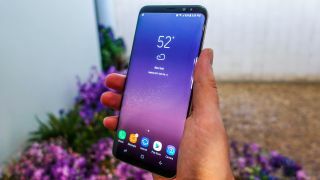 The Samsung Galaxy S8 Plus has a 12MP camera, one that’s similar to the Samsung Galaxy S7, which is no bad thing, as that phone has one of the very best smartphone snappers. The iPhone 7 Plus also has a 12MP camera, but it’s a dual-lens one, while the S8 Plus is just single-lens. That extra lens on the iPhone can be used to create a bokeh effect, blurring the background around the subject of your shots. You can also use it for 2x optical zoom, letting you zoom in without losing image quality. The Galaxy S8 Plus can't do that, but the core snapper will probably be at least as capable - though we'll let you know for sure in our full review. Round the front there's less difference, with the iPhone 7 Plus packing a 7MP sensor and the Samsung Galaxy S8 Plus having an 8MP one. There's a 3,500mAh battery in the Samsung Galaxy S8 Plus, while the iPhone 7 Plus has a 2,900mAh one. The battery in the S8 Plus is a lot bigger then, but it’s also got a much bigger screen to keep lit up. Comparing the actual life is tricky, but we expect the Galaxy S8 Plus would need a daily charge, and the iPhone 7 Plus does too, though it can comfortably last a full day. The Samsung Galaxy S8 Plus’s fast-charging tech should mean you can juice it up faster than the iPhone 7 Plus though, despite there being a bigger battery to fill - and the S8 Plus also lets you charge wirelessly. Samsung hasn't yet confirmed the price of the Galaxy S8 Plus, but rumors put it at $950/£780/AU$1,255, while the iPhone 7 Plus starts at $769/£719/AU$1,269. If accurate then in the US and UK at least you might pay more for the S8 Plus, but then it is a newer phone and you get more storage for your money. The iPhone 7 Plus price gets you 'only' 32GB, while the Samsung Galaxy S8 Plus has 64GB of storage. Although both these phones have phablet-sized dimensions, only the Samsung Galaxy S8 Plus really has a phablet-sized screen, which gives it the edge if you want a big phone. It’s also got a bigger battery and slightly more water resistance, but it only has a single-lens camera, while the iPhone 7 Plus has a dual-lens one, and the 7 Plus may actually be the cheaper phone. The biggest difference, as always when choosing between Apple and Samsung, is whether you want iOS or Android. But that aside the S8 Plus looks to be a strong competitor to Apple's finest. We'll let you know whether it delivers in practice once we've put it through a full review. Want more inspiration? These are the best phones around.